The faculty and staff of the School of Music are deeply saddened by the unexpected death of their colleague and friend Donna Parsons following a short illness. Donna’s connections to the University of Iowa are both broad and deep. Prior to her appointment as a lecturer she was an exceptional student here, receiving a Bachelor of Music, Master of Arts in Music, and a Ph.D. in Interdisciplinary Studies with concentrations in music and literature. Donna was also a popular teacher who enriched the lives of thousands of Iowa students through her courses both in the School of Music and in the University Honors Program. A social and cultural historian, Donna had a gift for drawing students into the study of popular music and culture as an academic discipline. 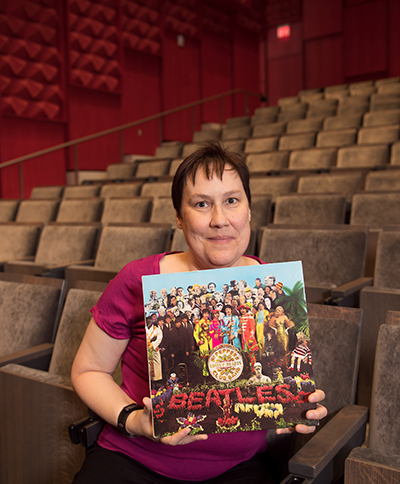 A large part of Donna’s research and teaching focused on the Beatles. Her office walls were dotted with photos from iconic Beatles landmarks throughout Liverpool, where she’d visited eleven times for research on a forthcoming book. She was a generous and thoughtful colleague whose positive attitude and indomitable spirit were noted and appreciated by faculty and staff alike. Donna was always smiling, always excited about her research and teaching, and usually moving through the building at the speed of sound. This page was last updated on May 18, 2018 . Please contact us at music-webmaster@uiowa.edu if you need further information.